Scotland, the heart of the whisky industry, has been a stable country since the battle of Culloden in 1746. Legalised whisky production, that we know today, started about 50 years later. This means that no Scottish whisky exists from a time when Scotland was having an identity crisis. 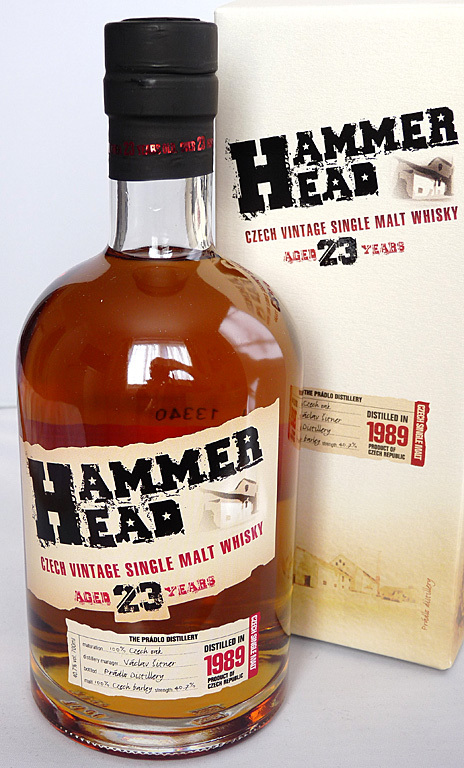 What’s wonderful (in a historic sense) about the Hammer Head single malt, is that it dates back to before the Czech Republic was called the Czech Republic (named in 1992). This whisky was distilled in 1989, the year the Berlin wall fell, and the iron curtain started to crumble. All this was going on but still the good people of Czechoslovakia found the passion and desire to cask up some spirit, and let it mature in peace for 23 years. When I say all that, you can understand why some people might think this a ‘novelty’ whisky, rather than something to be taken seriously. But 88.5/100 from Jim Murray (Whisky Bible author) and 86/100 from Ralfy are excellent scores from two people who know their drams. Jim Murray says in his review “don’t bother looking for complexity: this is one of Europe’s maltiest drams…if not the maltiest.” Malty sounds nice! On the other hand, 76.5/100 on Whiskybase shows this whisky might have room for improvement for some tastes. Whether malty or novelty, I’m still very pleased to have this bottle in my collection!